Lettuce Salad, Creamy Herb Dressing, Thyme for Cooking side salads. A small side salad to round out the meal. You can add bits of anything you have on hand: tomato, pepper, onion. Walnuts are such a good source of Omega-3 that I like to use them often. Prepare lettuce and put into a medium bowl. Add a bit of dressing and toss to coat (use tongs, it's easier). Taste and add more dressing if desired. 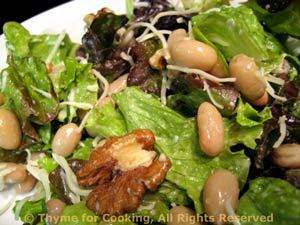 Add, beans, cheese and walnuts, give it another toss or two and serve, extra dressing on the side. In small bowl whisk yogurt, mustard and lemon juice.